I have a 40 gallon freshwater tank. I started with 14 guppies about 2 months ago and now I have close to 100. In my tank I have a few plants and a piece of driftwood. Everything was fine until a few days ago when I found a dead adult fish at the bottom of the tank. I found another one the next day and this morning a dead fry was floating around. 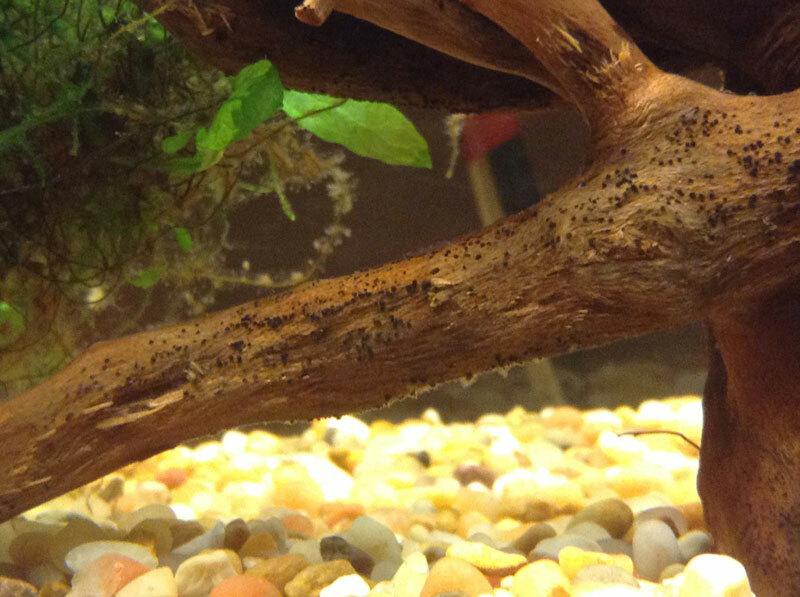 After looking around the tank, I noticed some black dots on the driftwood that I did not pay much attention to. I did a 40% water change and all the tests come back within the optimal zones. What is this? What causes it? How do I get rid of it? Any help / info would be much appreciated, thanks! Good to know about the food & aromas. I didn't think it would be an issue, but never know. In regards to the fish, they still look the same, but no dead ones for 2 days. Hopefully the water change helped. I have 10 guppies left. 2 almost adult and 8 fry. They are either solid white or deformed (like the nike swoosh weirdly enough). I moved them to my empty 5 gallon tank and started to repopulate the tank in the previously posted pics. I may be wrong, but this is the scenario that makes most sense. I am posting simply to add some (much lacking) info on this topic. I have a clown pleco now that has polished the wood so well, I can practically resell it as new..lol He is great but a little shy. He was added when I still had about 18 guppies in the tank. I started to have a major snail infestation that was likely due to something I added when I started my tank. They disappeared for a few weeks and I thought my scooping them out worked... but they came back with a vengence and before I knoew it there were egg sacks all over my glass and dozens of babies infesting the tank. I decided to buy 2 clown loaches. They are great. They eliminated the snails and are so cute. Too bad I will have to find them new homes one day because I dont think I wil be getting a 100+ gal tank. The colorful loaches were very active and fun to watch, but with them, the clown pleco and the guppies, I needed more color... so I bout 3 red platties. These guys are awesome. I added a couple of makeshift hiding spots (plastic pots with doorways and some glass mason mugs). The guppies were doing well in there, but I didn't want to chance that they may have had some unidentified contagious fish disease, so I moved them to the 5er. I then added 3 yellow (sunset?) platties and 3 yellow (pet shop labeled them golden diamond) molllies. I am very pleased with the look and variety of fish, but I would like to add a few more nice colors to the mix as well as some much needed plants and perhaps extra rocks. Which types of fish can I look for that are either bright green or blue? Thanks for your help and kindness. I look forward to posting more updates and reading through the rest of the forums. P.S. I had 3 rainbow sharks for a day and a half... long story short, google is better than pet shop workers sometimes. Sorry to hear about the guppy issues. While you may just be dealing with inbreeding, do keep in mind that fish with spinal issues can also be indicative of fish tb (which can be transmitted to humans). Just be careful with any open cuts or scratches when dealing with the tank. Gloves prove useful for sure. Glad you and enjoying your clown plecos, they are certainly tricky to find during the day. 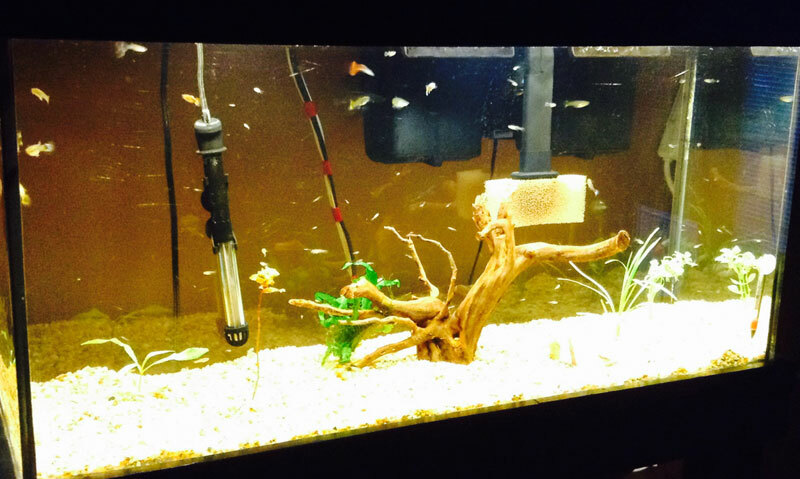 Consider some smaller species of loaches when you eventually remove your clown loaches. They will be more suitable to the tank size. I love my dwarf loaches, peaceful, fun, active, cool behaviour, and I haven't seen a snail since I got them. There are also some slightly larger types that are easier to find and less expensive. @CAAIndie wrote: While you may just be dealing with inbreeding, do keep in mind that fish with spinal issues can also be indicative of fish tb (which can be transmitted to humans). Just be careful with any open cuts or scratches when dealing with the tank. Gloves prove useful for sure. This freaked me out. I always have random cuts on my hands either from annoying plastic econo-seal packaging or from just being hands on in life. Can you elaborate please on how contagious this can be? I felt like we had a thread dealing with this topic, I'll try to find it. I mean it could even be vitamin deficiency, but any unusual spines and you cannot be too careful. Mycobacterium marinum (fish tb) probably lives in a lot more aquariums than we often realize, many fish don't exhibit symptoms until either they age or are stressed. It isn't actually tuberculosis, but is closely related to it. It can result in some really nasty sores that are very difficult to get rid of. My understanding is it can take some heavy duty antibiotics and lots of time to recover. It isn't commonly contracted by hobbyists, but one should be careful. One of our veteran members, @GaryE , has had the unfortunate luck to deal with this. Hopefully he can pipe in.